Have you ever wondered how rescue personnel get the training to know what to do in the event of a large animal rescue? Here is your chance to get involved and become a first responder in your area to help during a critical moment of need for an equine. Consider getting a group together in your area to join in on this valuable training. We are pleased to have caught worldwide attention with our recent helicopter lift of Colorado, a mustang stuck on a sandbar in the Gila River. This event brought awareness of how critical technical training is to a smooth operation that keeps the safety of horse and rescuers in mind. Please enjoy a video of the rescue at our website and check out our upcoming plans for LAR technical training on March 11/12 (Basic) and March 13/14 (Advanced) Training is filling up so be sure to email your interest so we can get you a registration form quickly! The basic class has been refreshed to add live horse time and has added new components. The class is two full days and $250.00 for each person. Remember to approach your local saddle and 4H clubs who are more than willing to sponsor attendance for a first responder in their area. Please contact us if you need sponsorship assistance to cover the tuition. Meals are included. Email info@azequinerescue.org for registration forms. AERO will be offering a one day advanced class and a half day specialty helicopter class. 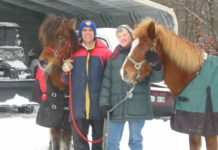 John and Deb Fox and AERO will be the lead instructors for this class. Cost for this class is $125.00 for Sunday and $50.00 for half day on Monday. 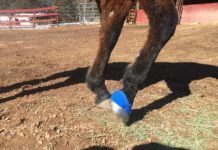 Advanced will go over new and additional techniques not covered in basic plus some new material being tested so it’s a great way to refresh and strengthen your Large Animal Rescue skills in between calls. Hope to see you there! Email info@azequinerescue.org for more info and mark your calendars. Do you or your club/group have this technical training? Have you ever been involved in any large animal rescues? 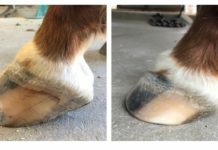 Next articleLaminitis, Do You Know Enough?